Sleepy's wife Erin likes to tell the story of how her husband has always been plagued with tow vehicle troubles while getting to and from the races. She claims it all started back when the Tripps were racing the Quarter Midgets. 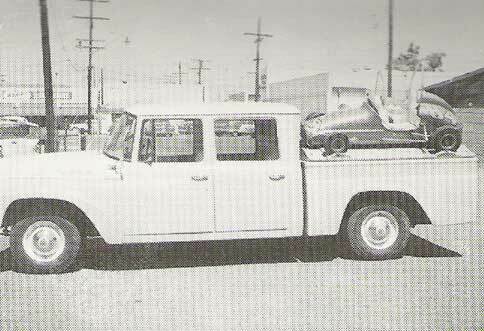 Breaking down while towing the Quarter Midgets to the races got to be such a constant occurrence that it was becoming an embarrassment for the Tripp family. One time the tow vehicle broke down and Sleey's father (Jerry) tried to hide it behind a bridge so no one would see them. They were not to successful in hiding because there is an old photo floating around of several racers parked along the side of the road that day and offering a helping hand with the tow vehicle repairs. Erin laughs when she say's, the break downs never stopped! They (the break downs) were a thorne in the side from them days on. I bet that old cornbinder seen a few races as well as a few breakdowns! Gaining a reputation for breaking down was quickly diminished by the reputation the Tripp Brothers were establishing in the Quarter Midgets. But it wasn't long Sleepy had outgrown the miniature race cars. Sleepy was a stocky-built kid with powerful upper-body strength. This has been a good tool for him in his endeavors as an adult but was a bad thing back then when he had to race against kids forty pounds lighter than he. By the time he was twelve it was becomig harder ad harder for him to collect those trophies. It became evident that even at that young age Sleepy didn't like losing. This left a very competitive young Sleepy with a need to challenge himself but he was too young to move on to bigger cars. Football became the sport which would satisfy that need for several years. 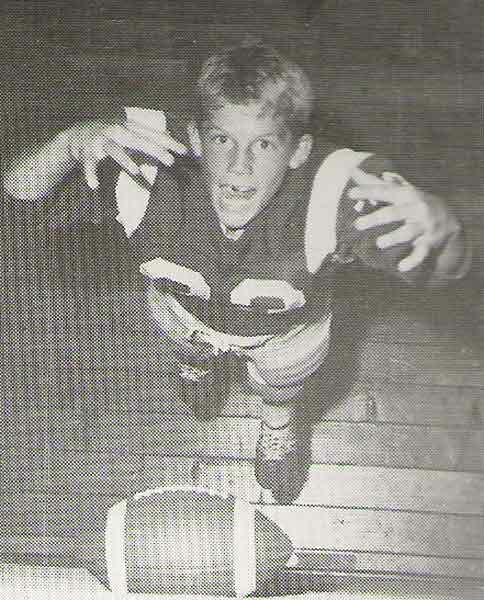 It began with Pop Warner football and like his racing, Tripp attacked the game with an unbridled aggression to win. It was no wonder; high school football was also part of the Tripp family heritage. This tradition goes way back to 1942 when Sleepy's uncle Don was an All-CIF guard on Newport Harbor High's team. Sleepy's father (Jerry) playedthe same position in the late 40's and 50's. Still another uncle (Carl Bergeron) played as an ALL-Star guard. Bobby, Sleepy's brother also played guard position and was ALL-County two years before Sleepy stepped in to "fill his shoes" at the very school that all of those family members arrended. Sleepy during the Pop Warner football years. 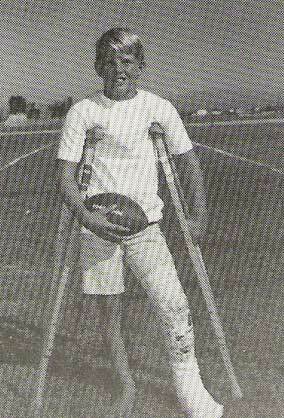 More Pop Warner football -Oops - broken leg, I never noticed that it bothered him!